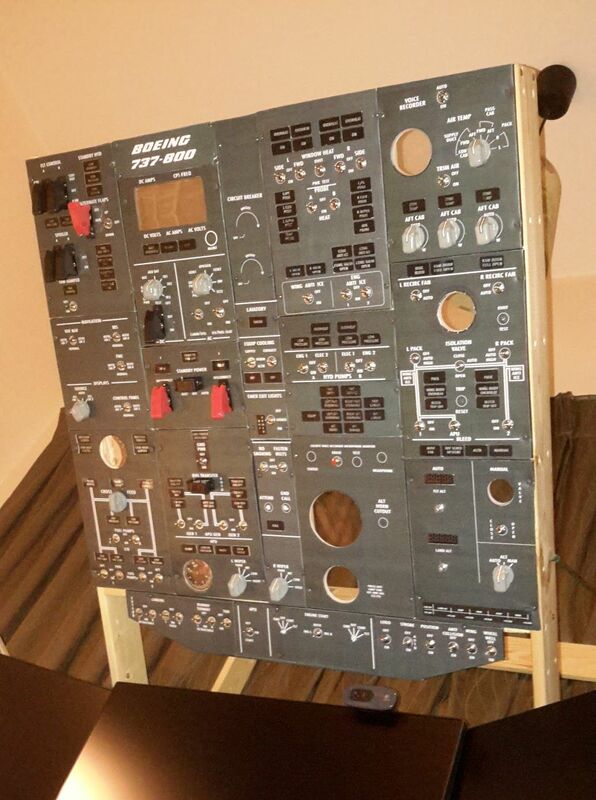 DIY Boeing 737 Overhead Panel - Part 2 - Panel Faces | Life, The Universe and ... Everything! Having built a frame and a stand for the 737 Overhead Panel in Part 1, I now look at building the "face" of the individual panels. Most of this is heavily inspired by Peter of Build a Boeing's youtube videos. There are a number of materials that can be used to make the panels. The ideal material would be 3 mm white acrylic/plexiglass, painted with the panel colour and then run through a CNC mill to cut them to shape, cut and drill out holes, and then engrave the labels and graphics on the surface. Engraving the labels and graphics on the surface exposes the underlying translucent plastic, so that when a light is shined from the rear, the labels and graphics will light up, giving a warm glowing backlit effect. The problem is of course, I need access to a CNC milling machine. As tempting as it was to "invest" in a Shapeoko 3 CNC Mill (MYR 6000 with shipping!) just for this project, common sense prevailed and I explored the materials available at the local art supplies shop instead. I first tried using 3mm mdf -- my local art supplies sells sheets of this in various sizes. This is quite sturdy and it is thin enough that I could cut out the panels with a sharp blade by scoring a few times. However, I was not able to cut out rectangles and curcles neatly by hand, and resorted to making a jig for use with the router bit on my rotary tool to cut the holes. Even then, this produced so much dust and also would often break the separation between adjacent rectangles, which then needed a lot of "patching up" -- so much so that I gave up on using MDF. Next up was Foam Core boards. After watching Adam Savage' model building project, I experimented with 5mm foam core board. This consists of a layer of foam sandwiched by two sheets of card. 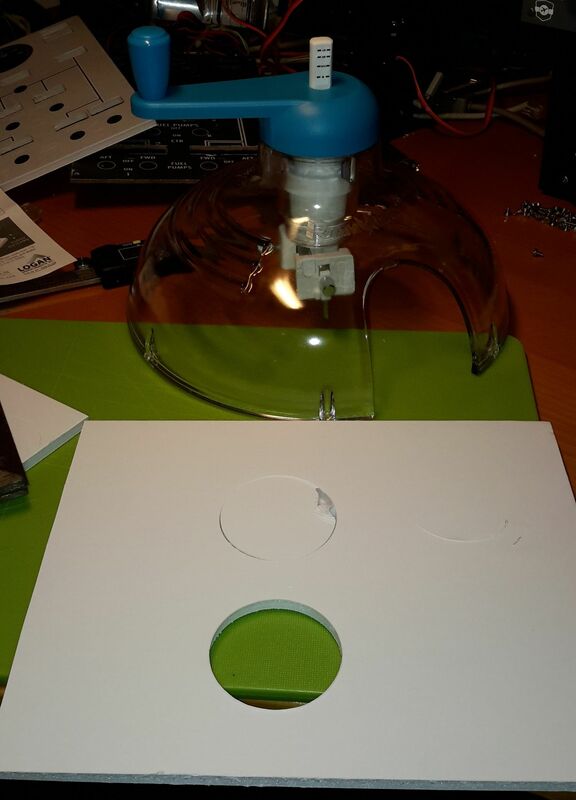 It is extremely light and also easy to make precise holes in. The foam is not thick enough to support much on its own but together with the laminated card it is "strong enough". I decided to use this as my base material. Halfway into my build I discovered the "foamalux" product that Peter of Build a Boeing used. It's more commonly known as PVC Board board where I live, and available in various thicknesses from 1mm to 5mm. Because it's made from just one material, the density is consistent throughout, making it easy to cut through. It's also quite dense and will hold the shape of a drilled hole neatly. A 3 mm thick 45 cm x 60 cm board costs MYR 10.80. 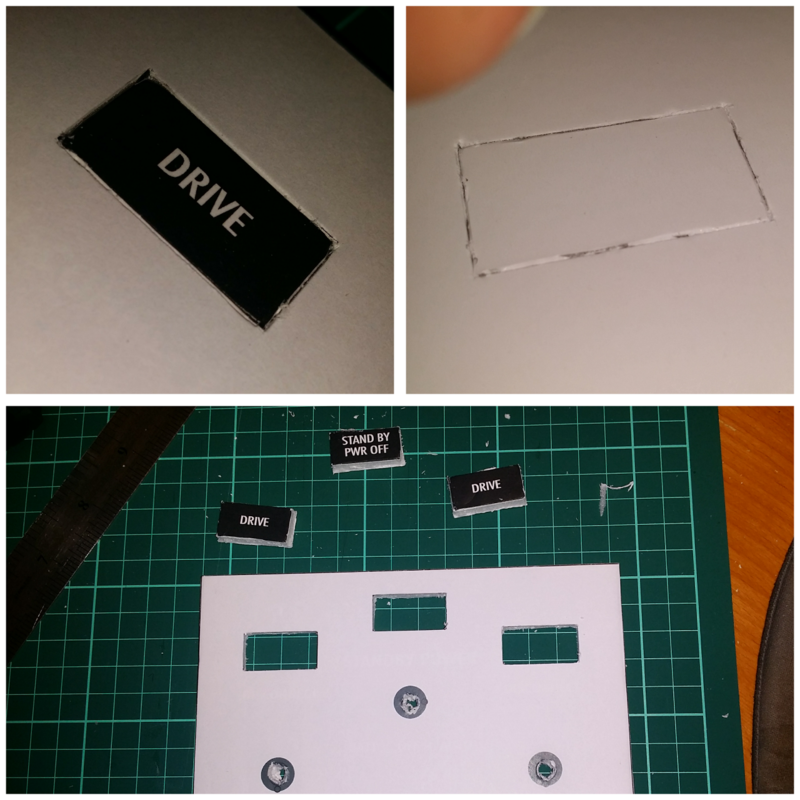 I'd suggest getting a sheet of 5mm foam core and 3mm pvc foam and see which you are more comfortable with cutting accurate rectangles and circles in, and sticking to that. I ended up using both materials in different places. 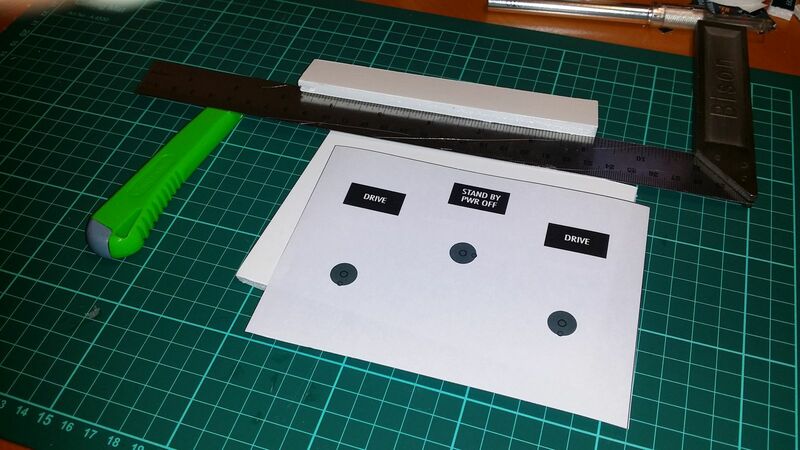 An essential tool for working with foam core is an x-acto knife. I found a #2 medium weight aluminium knife with a #2 large fine point blade had just the right weight and strength for cutting straight lines through foam core. A large blade knife would be preferable for PVC foam (preferable one without snap-off blades). A proper cutting mat will also reduce wear on our blades. A metal ruler (better still one with a square edge) is of course necessary for cutting straight lines. I used mostly white all purpose craft glue, although hot-melt glue can be useful in some situations. 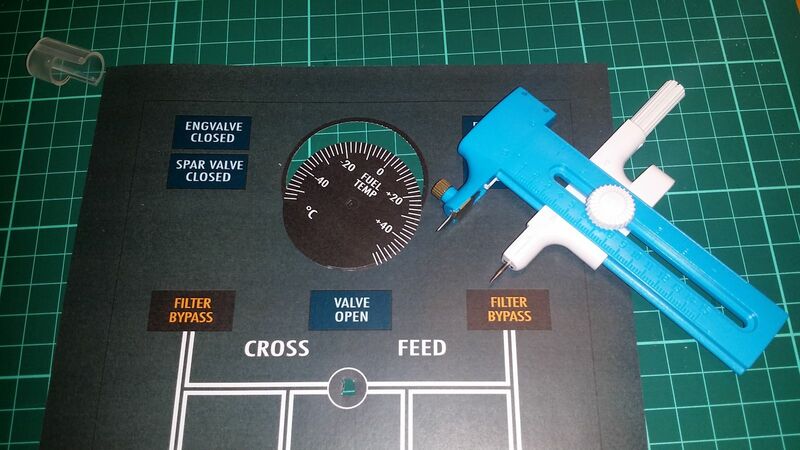 A small drill, or a power screw driver with a chuck adapter, and 3mm, 5mm and 8mm drill bits is needed making holes. 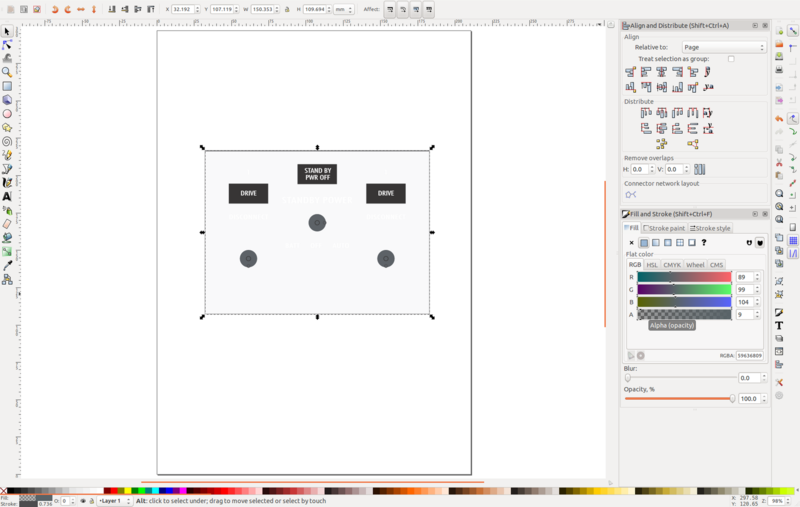 I start out by opening Peter's Overheads Adobe Illustrator file in Inkscape (a free vector based graphics editor) and selecting the panel I want printed (Hold shift and select the area). Then copy this to a clip board and create a new document, and paste it. 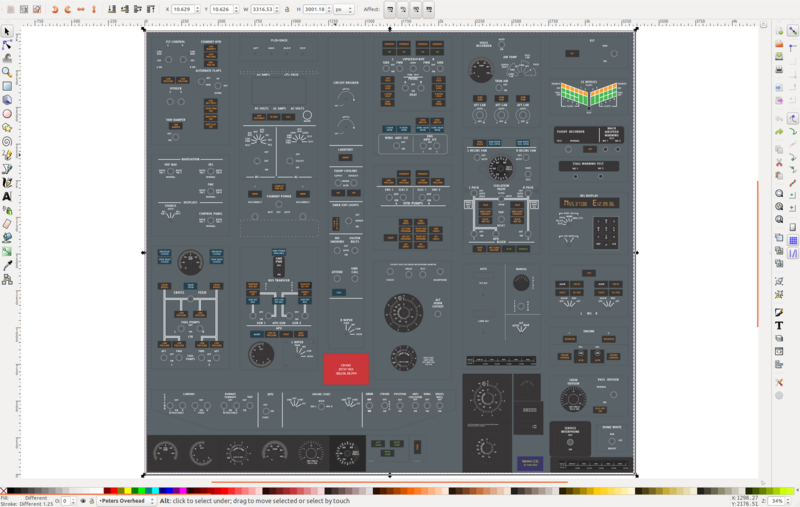 Since I'm just printing a template, I don't need to waste toner by having it in full colour, so I reduced the alpha of the panel. To do this, press Shift-Ctrl-A to bring up the Align and Distribute dialog, and center the object horizontally and vertically within the page. 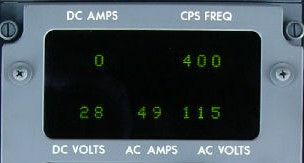 Select-All and Ungroup, and select the panel background. Press Shift-Ctrl-F to bring up Fill and Stroke and bring the Alpha level down to 5%. Print this out and trim the edges and I have a template ready. Next cut out a matching rectangle out of foam core. Although I used white foam core, I'd suggest using black foam core if possible. It's more expensive (at least in my local shop) but it's more forgiving if some of the material shows through. I fixed the template to the foam core using adhesive spray. This creates an even coating of glue which doesn't tend to soak through the paper. These just need a 6mm hole drilled through the panel. Foam core doesn't hold holes well, so this is more of a way to just clear the path. I started drilling with a small 3 mm bit and then working my way up to the larger size. The switches are really held in place by the washers and nuts on the shaft. I found when drilling into paper it helps to score a box and a X over the drilled area -- paper tear away cleanly. The majority of the switches are of the two position OFF-ON type, although some are three position (ON-OFF-ON). The APU switch is special in that it is a three position switch but the third position is momentary. Almost all are of the SPDT type, so for the OFF-ON I just leave one terminal unconnected. For the battery switch, I used a DPDT switch so that I could use the same switch to signal the sim that the battery is connected, and also turn on the 5V power supply to the overhead panel. Most of the switches on the 737 Overhead Panel have a dome on the end with a white rubber cap. This makes it easier to select and also easier to see the current position. The replicas for these were going for like a few GBP each (switch not included), which was too expensive for me. I'm still looking for a low-cost solution for this. 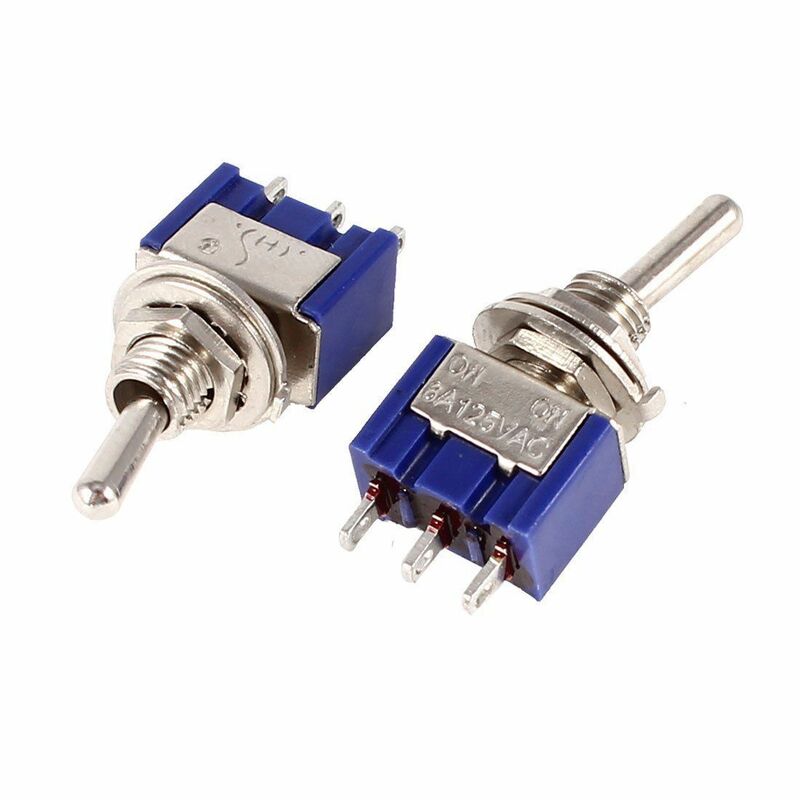 I bought my toggle switches on eBay (search for "mini toggle switch"), although most electronics shops have them. 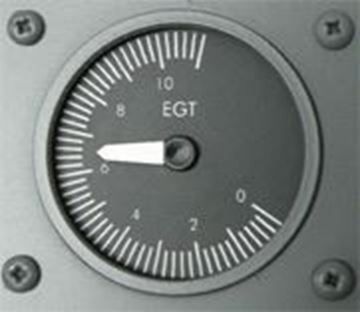 This is used for a switch that is usually in one position, but can be toggled if the pilot is really sure what he is doing. To ensure this, the cover must be lifted and left open to expose the switch before it can be toggled. Closing the cover also forces the switch back to the regular position, therefore the direction the cover sits in is important. The covers attach using a washer and nut on the toggle switch shaft. 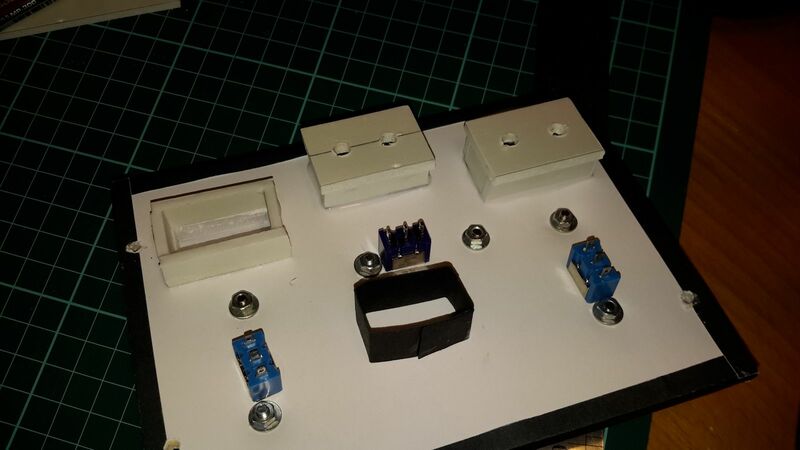 However, with a 5mm thick panel, my toggle switches were too short to incorporate these, and the washers I had were too small. So instead I drilled two holes at the ends of the safety cover's base plate, and then used M3x10mm bolts and washers and nuts to secure them in place. I bought my safety covers on eBay (search for "toggle switch safety cover"). Similar to a toggle switch but this selects from multiple choices. The ones I found on eBay usually have 12 selection points. 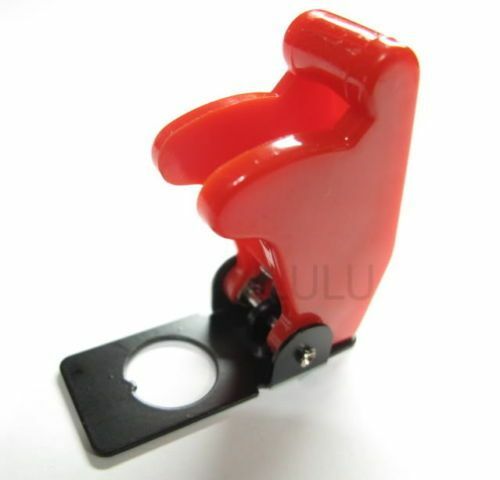 A special o-ring with a tab can be inserted to stop the rotation at any of these points (check the listing, some sellers sell this without the o-ring). With 12 positions, each position is set (360/12) at 30 degrees apart. However, most of the knobs on the real 737 use 45-degree (8 position) rotary switches. Peter's overhead graphics have the positions adjusted to suit 30 degree rotary switches, as these are more common and cheaper. 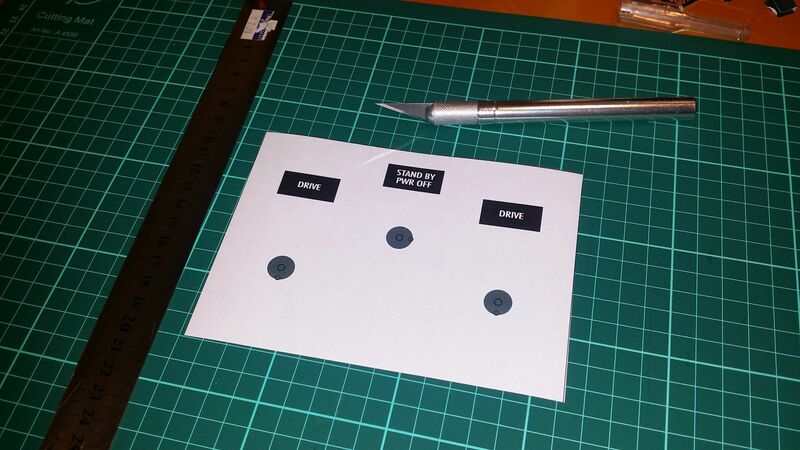 If using 45 degree rotary switches, the labels needed to be amended. I used 45 degree rotary switches for the knobs on the AC/DC Metering Panel. The parts can be found by searching eBay for "rotary switch 1 pole 12 position". The regular "short" shaft rotary switches will be fine for most switches; however I wanted to add automation to the engine starter selectors (they move back automatically from GND to OFF once the engines have fired up), so I got two of the "long" shaft variant. The switches don't come with knobs. 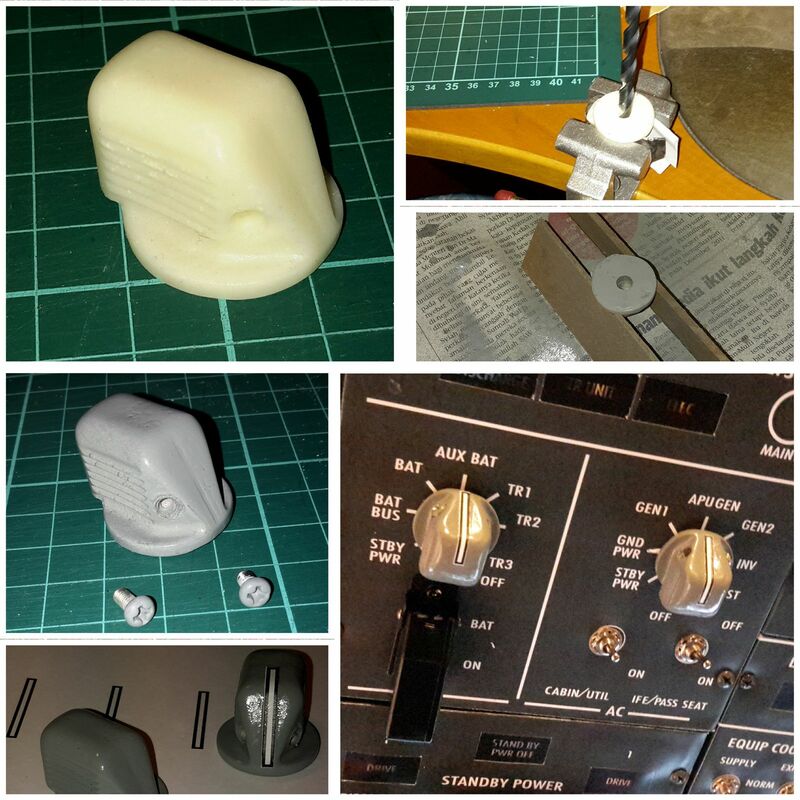 I splurged a littled and got replica Boeing 737 knobs. Otherwise almost any knob does the job. If shipping costs are reasonable (a visiting relative brought mine over from the UK) I suggest going for the replicas; they add that touch of authenticity. The replicas are usually 3D printed and come unpainted and with no holes. I drilled a 6mm hole in the center for the rotary switch's shaft, and also used a 3mm tapping bit for the set screws. The knob and screws were spray painted (#4 Executive Gray). Rather than attempt to paint the stripes, I laser printed and stuck them on with white glue. The set screws didn't work too well for me. While it would grip the shaft well enough to turn the selector, if I forced it beyond the last point of rotation, the knobs would end up sliding against the shaft. This is probably because the shaft is knurled and doesn't offer a good grip. I solved this by drilling into the shaft and using a longer M3x10 screw to secure the knob to the shaft. 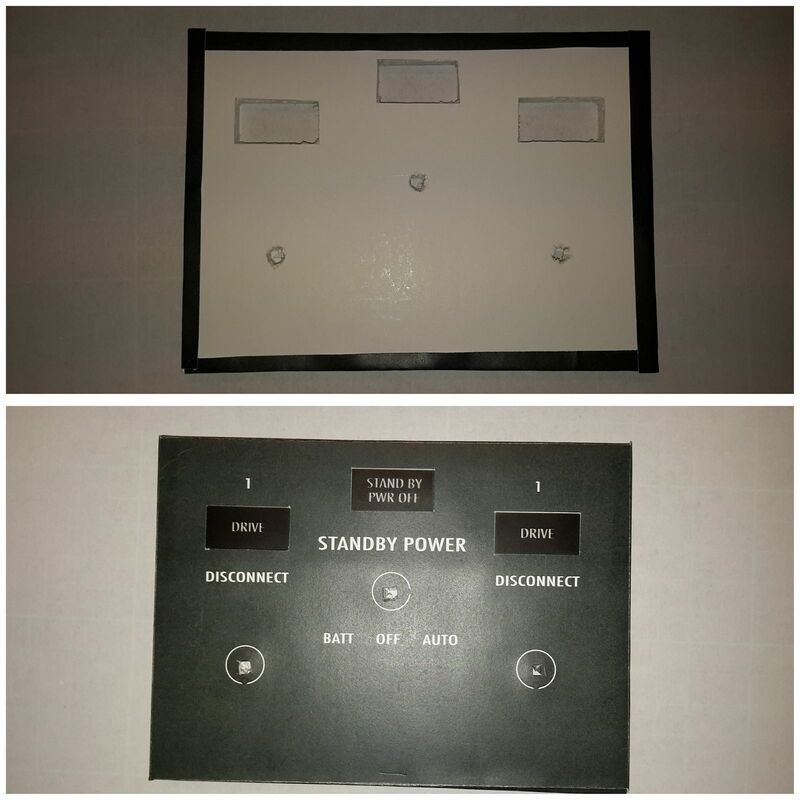 These indicate to the controller whether they are being turned clockwise or anti-clockwise. You've probably seen them in the newer car radio's volume control. They actual position of the knob is irrelevant (they'll spin forever), it's just how much and in which direction they're rotated that counts. The ones I bought also feature a push-button switch on the shaft, so pressing them down will send a signal to the microcontroller. On the overhead these are used to set the ground and cruise altitude for the pressurization system. I believe the real ones are dual-concentric knobs, with one knob used to set the integers and the other for the decimals. These kinds of encoders are quite expensive, and not to mention difficult to find knobs for. In my case, I'll use the regular turning of the knob to set the integers, and pressing the knob in (and enabling the switch) while turning to set the decimals. 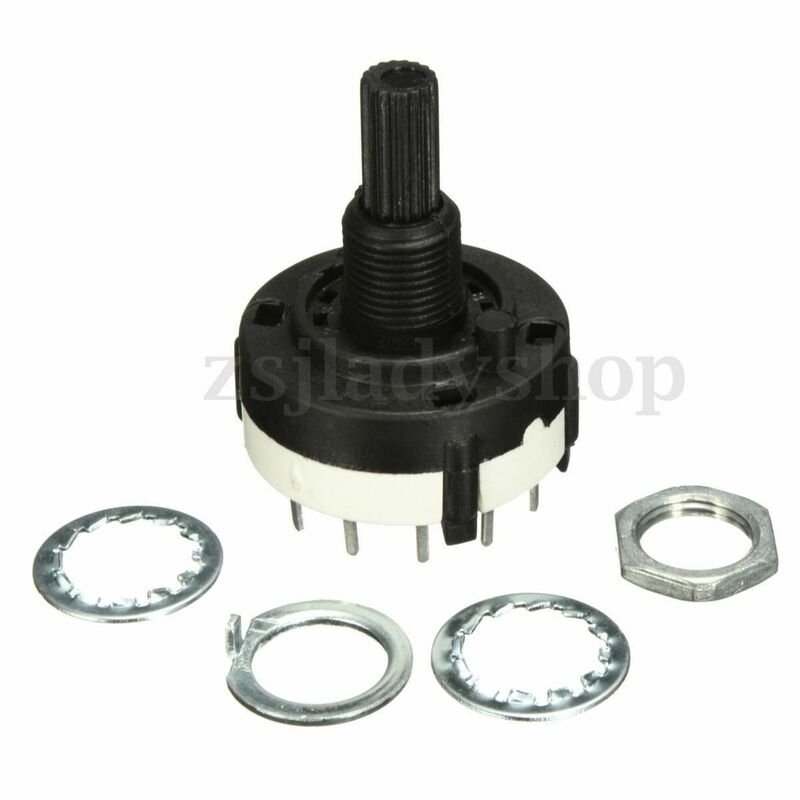 They can be found on eBay by searching for "rotary encoder". These are the coloured rectangles that light up to alert the pilot about something. The 737 overhead has blue and orange annunciators, which we will light up using coloured LEDs (two per annunciator). You can buy a ready made solution for this for a few hundred GBP, but of course I decided to make my own for much less. On my panel, these require the most preparation. First, I needed to cut a hole into the foam core exactly where the rectangle is, following the template . The X-acto craft knife is essential for this. It needs a deep cut on the top side supplemented with some scoring of the cut lines on the reverse side. Once this is done, the rectangle pieces will slide right out. 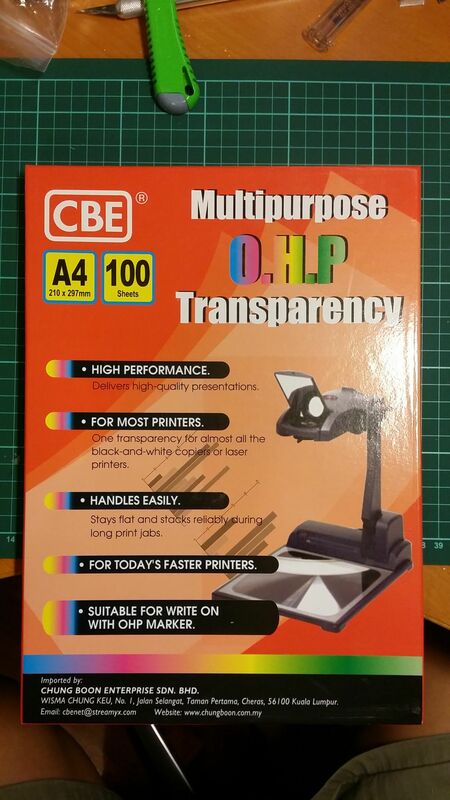 Next I needed to print the panel template onto transparency sheets (called "Overhead Projector (OHP) transparency sheets" at my local stationery shop -- they can be quite hard to find. I've not used one in over 20 years! They have to be specifically made for laser printers, the ones that are for markers may melt in the printer. Before printing, I changed the colours of the letters on the template to white (so they are transparent when printed, and let the LED light shine through). I removed the rest of the panel objects leaving just the annunciators. We need to print two copies. Cut them out in groups leaving a 1cm margin around the annunciators and leaving some empty space for glue (you don't want to glue over the annunciators). 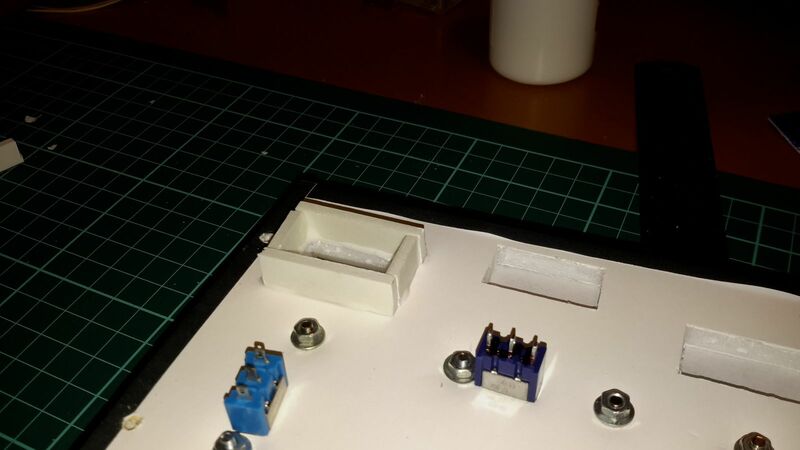 Try to avoid having transparencies over holes for switches and other things, it just gets in the way when cutting holes. I also used some very thin paper to act as a "diffuser" layer. Without this, the LEDs show up as two bright points behind the annunciators. The thin paper helps to spread the light around evenly. Getting the right thickness is tricky; too thick and the light becomes dim, too thin and the LEDs show up. Fortunately, my OHP transparencies came with some thin sheets of paper separating the transparencies, and this paper was just right. Some thin tracing paper may also work. This should be cut to a similar size as the transparencies. 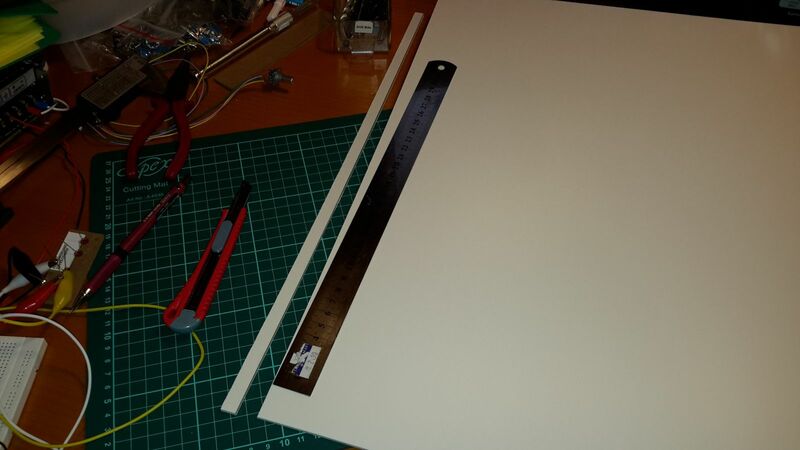 Now glue these sheets onto the foam core panel -- first the thin "diffuser" paper, and then the two transparent sheets. I used regular craft white glue for this. Avoid glue near the annunciators, as they tend to smudge the view. And bear in mind the glue will spread when the sheets are pressed down! While the glue is wet the transparencies can be slid around around to get them to line up properly. Shining a bright torch light from behind the panel will help in aligning the annunciators over the holes accurately. I let each layer dry for about 10 minutes at least so that when I started sliding the next layer around, the lower one stayed put. Perfect alignment of the 2nd transparency over the 1st is crucial ... the text will appear blurry until they are both in perfect allignment. 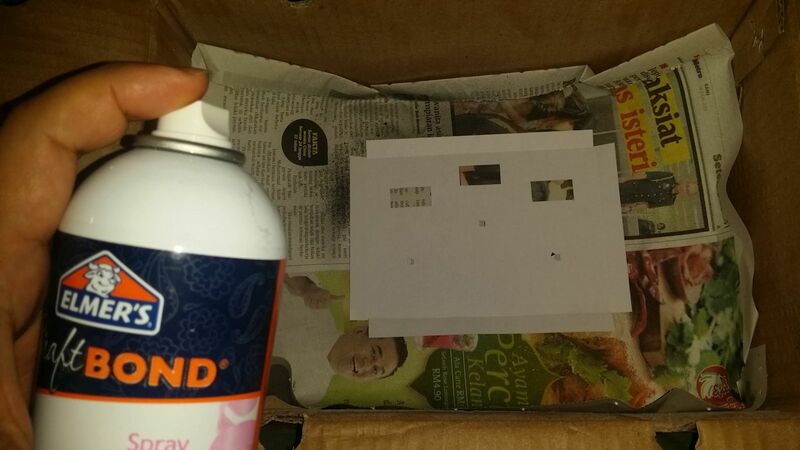 It takes a couple of hours for the glue to dry properly. 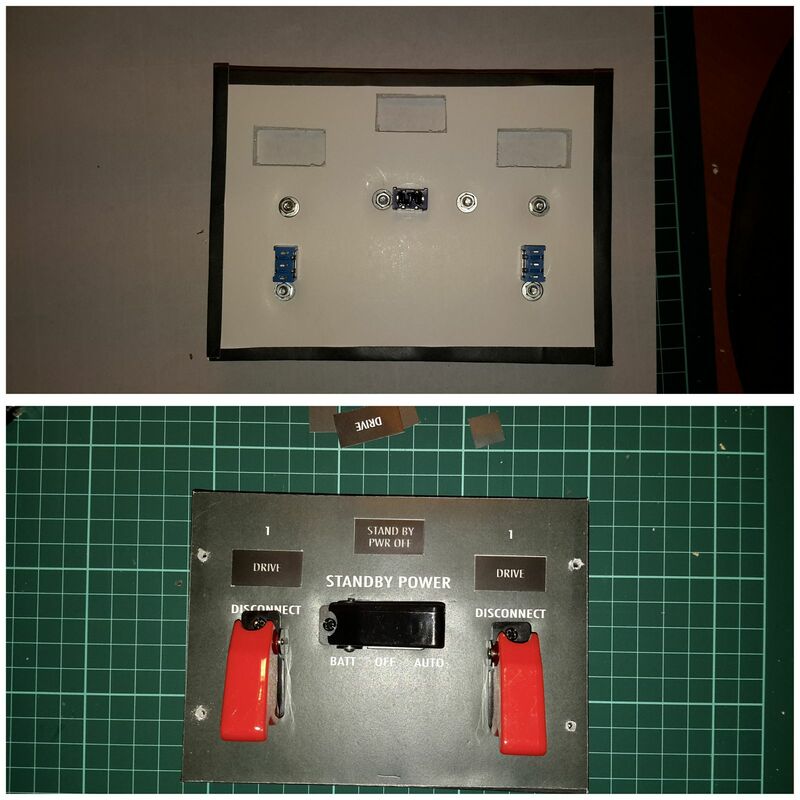 Next I needed to construct a "Light Box" at the back of the panel, to prevent the light from one annunciator from bleeding into adjacent annunciators, and also to prevent external light from entering. Foam core is probably not a good material for this, as a denser material is required to hold the LED bulbs in and to block out the light. I started making these with MDF but switched over to foamalux/3mm pvc foam boards. I started by cutting out a long 1 cm thin strip. From this long strip, cut out 33mm (for the top and bottom) and 14mm (for the side) pieces respectively, and glue them around the annunciator hole. If the anunciators are side by side, the strips can be combined or extended. I tried to make sure the cuts are "square" so that the pieces join up neatly but this did not always end up being the case. The strips were glued around the sides of each annunciator hole onto the back panel using white glue and left to set. If the anunciators are near the edges of the panel, beware of the mounting frame on the overhead -- if it is too close it may be easier to substitute the mounting frame itself for that edge. Next cut out a long 33 mm wide trip. This will be cut further to be the "tops" of the box. Into this I drilled two 5mm holes, around 7 mm from the shorter sides. They should be spaced so that the light from the LEDs falls evenly. The neater and more square the work is, the less chances of there being holes in the boxes and light leaking in. Optionally, a black piece of paper inserted into the rectangle can help ensure no light enters from the sides. Digit displays output values as numbers. They're built from electronic components called Segment Displays, and can be wired up from many individual digits or using pre-built units of 3, 4, or 5 units. On the 737 Panel they're used in the AC/DC Metering Panel and (on newer models) for the ground and cruise altitude in the Pressurization Panel. The segment displays need to be soldered onto a PCB mounted behind the panel. 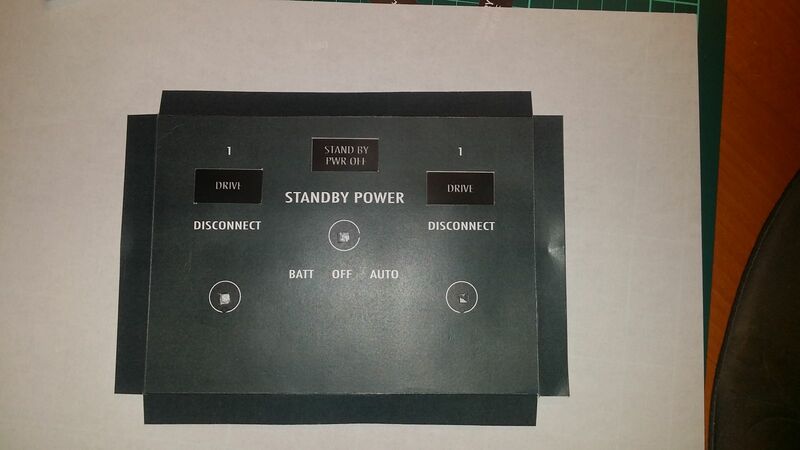 At this stage, I just need to cut a hole in the foam core board that is big enough for the display. To prevent the unlit segments being visible, a tinted film is used to cover the hole. The tinted film needs to be dark enough that you can't see through, but not too dark that they make the lit numbers dim. I managed to buy a small amount of tinted film that was being sold for car headlights. Those sold for car or house windows will work too, as long as they are not too dark. You could also try hanging around car accessory shops and see if they have any scraps. 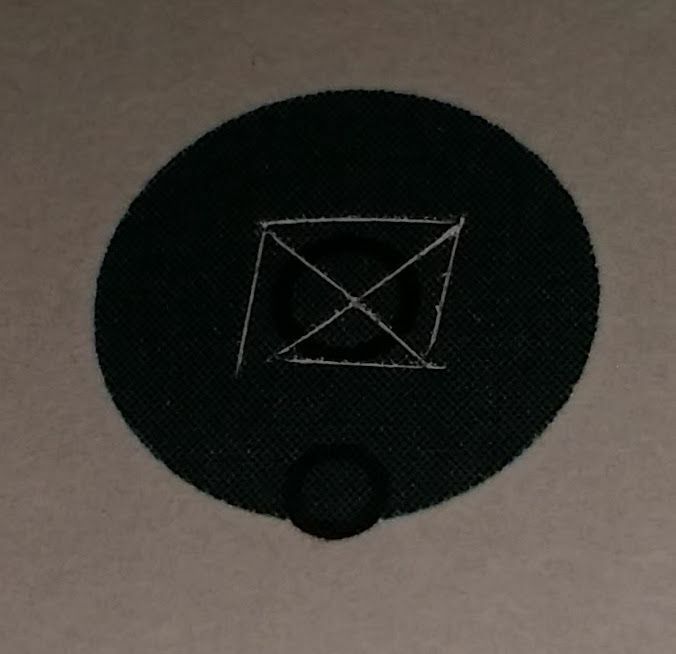 These are "clockface" indicators with a needle pointing to a reading. It's the most complicated device on the overhead panel that we need to build, but at this stage all we need is to cut a circlular hole in the foam board and cover it with clear transparency film. You can cut a circle in the foam board by hand with an X-Acto knife, but it's hard enough to cut a perfect curve. I invested some money in a proper foam board circle cutter from foamwerks. Once you get the hang of using this, it cuts perfect circles. It's pricey at MYR 180 but I'm useless at cutting without a guide, and an uneven circle is very obvious (Note: This tool only works with foam core, if you're using pvc foam you're on your own!). Now it is time to print the final top sheet. 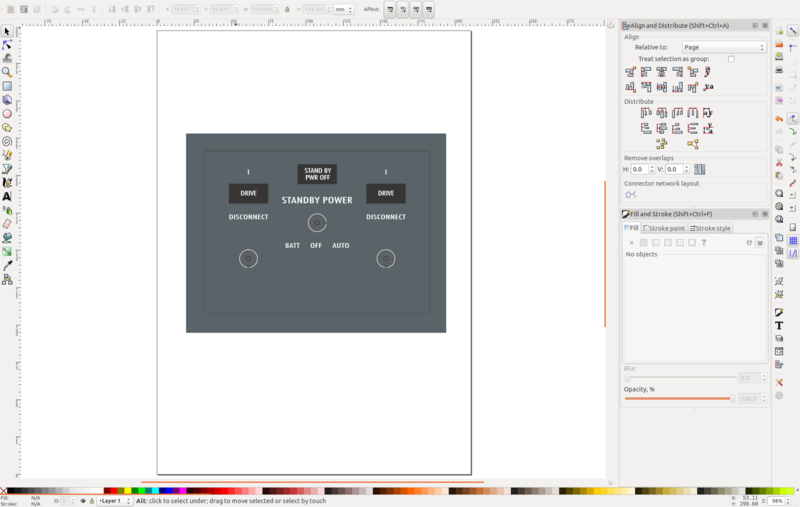 Reverting back to original panel graphics in Inkscape, I drew a rectangle with a 1 cm margin around the original panel, set this to the same colour (#596368ff), and lowered this to the bottom. I printed this out in full colour on regular 80gsm paper. For holes to be drilled, I scored X's on them like with the foam core panel and then drilled, using 3 mm sized bit to begin with, and increasing to larger sizes. 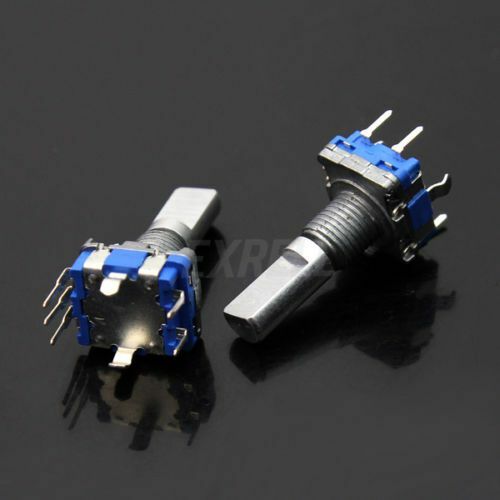 Toggle Switches, safety covers, rotary encoders need a 6mm hole. Rotary encoders need a 8mm hole. 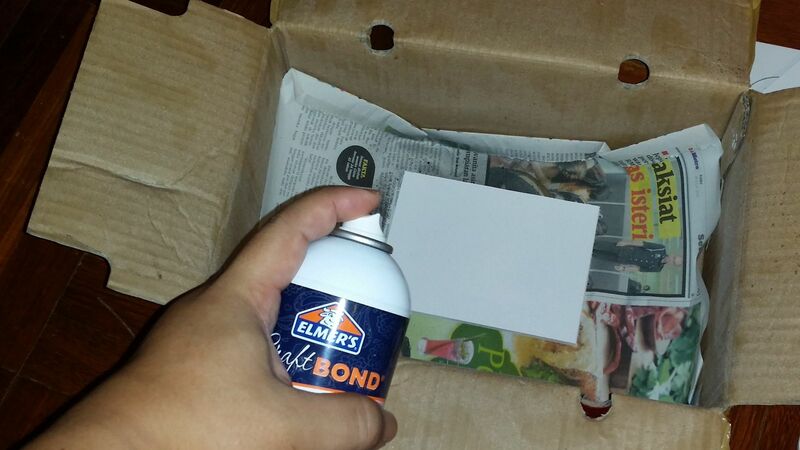 Flip the top sheet over and put it into a box, and spray adhesive over the back. Next, I carefully positioned the top sheet over the panel, making sure the annunciators and any other holes aligned exactly. Once that is perfect, press down, and fold the sides over. Now we're ready to fix any toggle switches, rotary switches, and rotary encoders. For toggle switches and toggle safety covers, be sure to get the directions they face correct. For toggle safety covers, I needed to drill two additional holds to mount it. I just positioned the cover at the right spot, drilled through it and the panel, and fixed it with a M3x10 bolt, and secured it with a M3 washer and nut on the back. There is some wiggle room so make sure the toggle covers are aligned properly and do not cover any of the labels (oops!). And be careful not to scratch the surface of the top sheet when moving the safety cover around (double oops!). Finally, I drilled four holes at the sides so that the panel can be mounted onto the frame. It's worth painting the heads of the screws and bolts. I painted the ones for the safety covers black, and the panel mounts were painted with anchor spray paint #35 "Honda Gray" which closely matches the background of Peter's panels. Be careful when screwing them in so the paint doesn't get scratched off. n Part 3, we shall build the back end an annunciator!